Fall is definitely here now and winter is fast approaching. As the days get colder, I have a tendency to crave warm beverages and drink them all through the day. 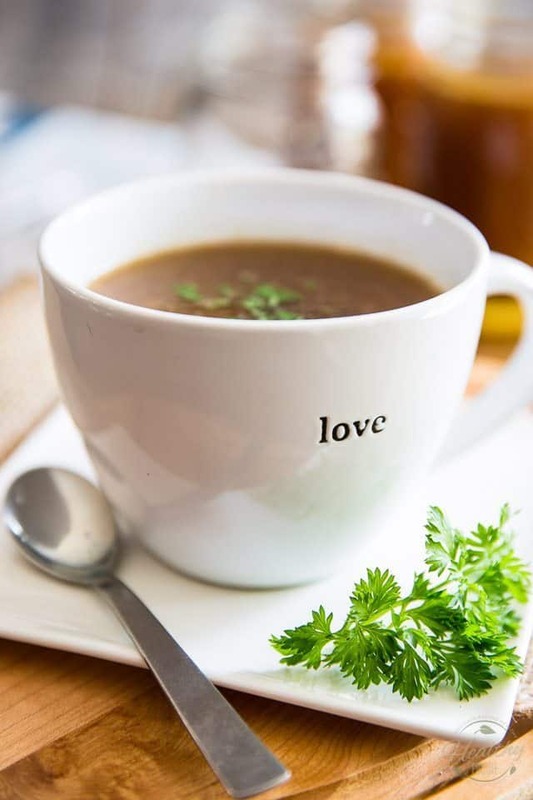 In the morning, you couldn’t pry me away from my much needed cup(s) of coffee, but in the afternoon, I like to switch to green tea or even better yet, bone broth! Not only is bone broth delicious, but it’s also super good for you! 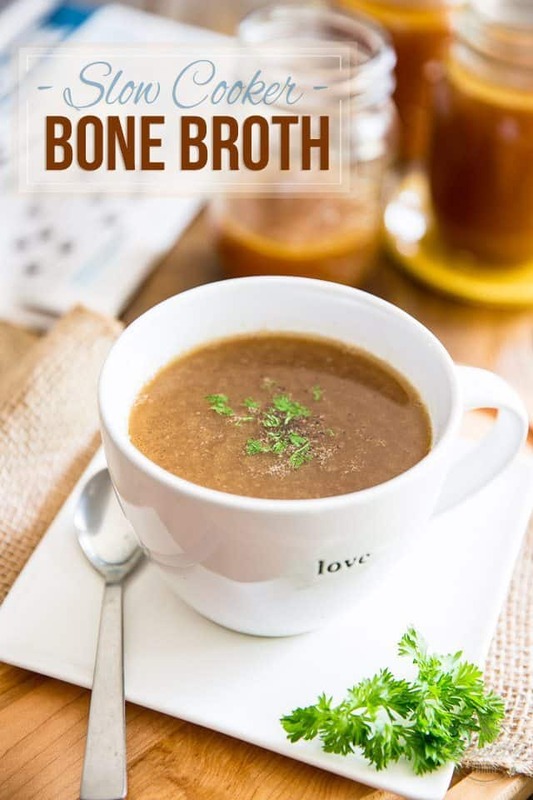 As the bones simmer for a very, very long time, all the collagen in the animal bones is broken down and released into the broth, supplying it with an abundance of protein, antioxidants, and amino acids, which helps heal your gut lining and improve your immune system. Not only that, but a large amount of healthy vitamins and minerals also get released into the broth, making it rich in glucosamine, calcium, magnesium, and phosphorus. Bone broth is a natural healer that can help fight infections and will greatly aid digestion. It does marvelous things to your skin, nails, hair, teeth and bones! I could go on and on about the benefits of bone broth, but I’ll let you read for yourself and get busy showing you how to make it, instead! 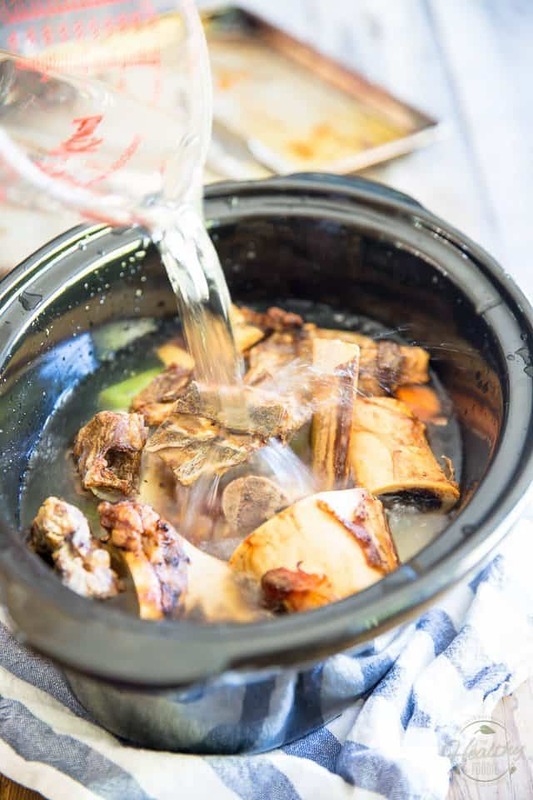 As much as possible though, when making broth from bones, you want to try and use bones that come from well sourced, organically raised, pastured or grass-fed animals. So yeah, as much as possible, stick to the well sourced bones. 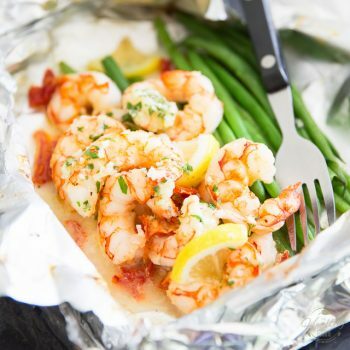 To start, preheat your oven to 400°F; place the bones in a single layer on a baking sheet or roasting pan and roast them for 60 minutes, flipping each bone over half way through cooking. 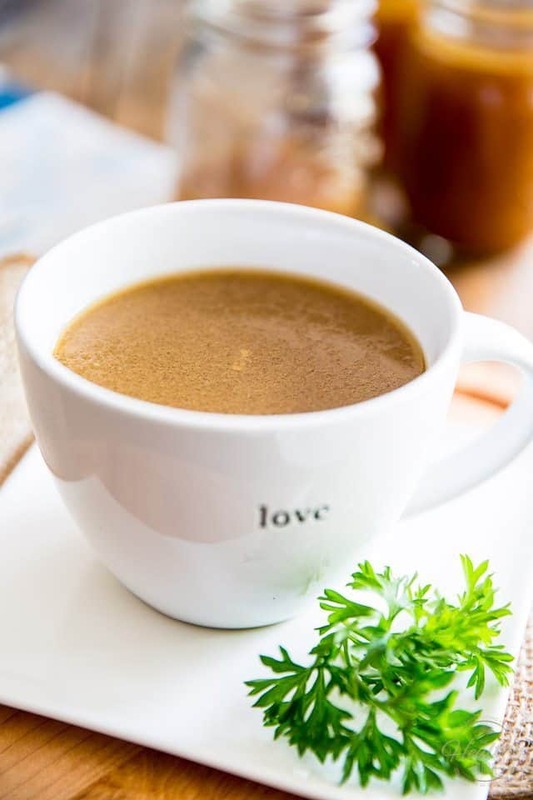 Personally, I prefer not to add any salt or pepper to my bone broth and to season it only when I actually use it; I find it gives me better control over how much to add, depending on what I use it for. If you preferred to give your broth a little bit of a pre-seasoning treatment, I suggest that you do it here: simply sprinkle your bones generously with salt and pepper before roasting them. Seriously, I mean it. Don’t ever skip this step: you’ll be sorry you did! While your bones are in the oven, roughly chop the vegetables and place them, along with the bay leaf and apple cider vinegar into a 6 quart slow cooker. These will be discarded later so you don’t have to be precise or even with your vegetable chopping! Don’t even bother peeling them, either, especially not the onion: onion peel greatly contributes in giving broths a nice deep golden color! As for the apple cider vinegar, fear not: it will not confer a vinegary taste to your broth. In fact, you won’t even be able to taste it at all. The reason for adding it is that it helps in drawing more of the good stuff from the bones. …and then fill the pot completely with water. Don’t be afraid to let that water level get fairly high! The broth will never get to boil violently; rather, it will simmer very gently for a very, very long time, so there’s no danger of it boiling over. Just maybe leave about an inch at top and you will be fine! 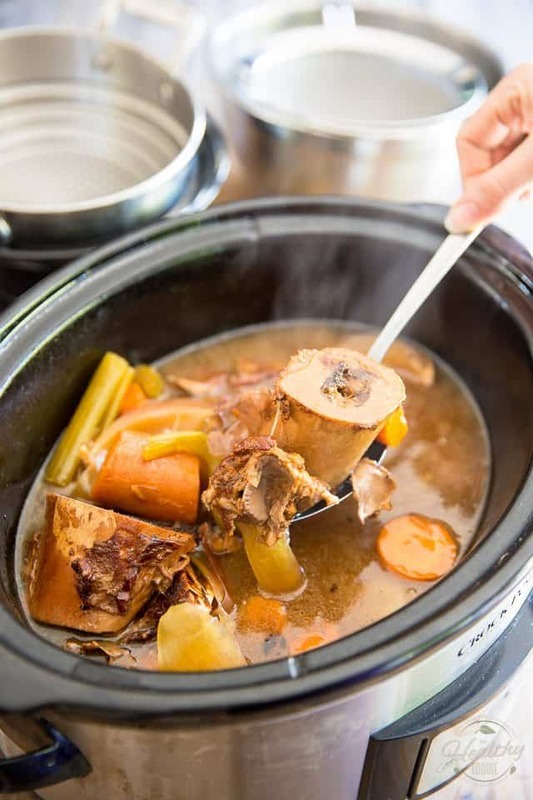 Set the slow cooker on low, cover and cook for 18 to 36 hours, or until the broth has reached a beautiful brown color and has filled the house with the most intoxicating aroma. A simmering time of 24 hours is recommended to draw the maximum amount of goody good stuff out of the bones, but if that’s too long for you, 18 hours will still yield very satisfactory results. Of course, if you can afford to go even longer than 24 hours, by all means, go for it. The longer you can leave it on, the better! Once the broth is done to your liking, carefully remove the larger pieces with a slotted spoon and place them in a strainer set over a large bowl to collect the excess broth. You’ll be surprised at how much liquid gold actually drips out of these scraps. You can also press them down a little, to help get even more of the precious liquid out of there. Once that’s done, you can discard all of this. It’s done its thing, trust me! 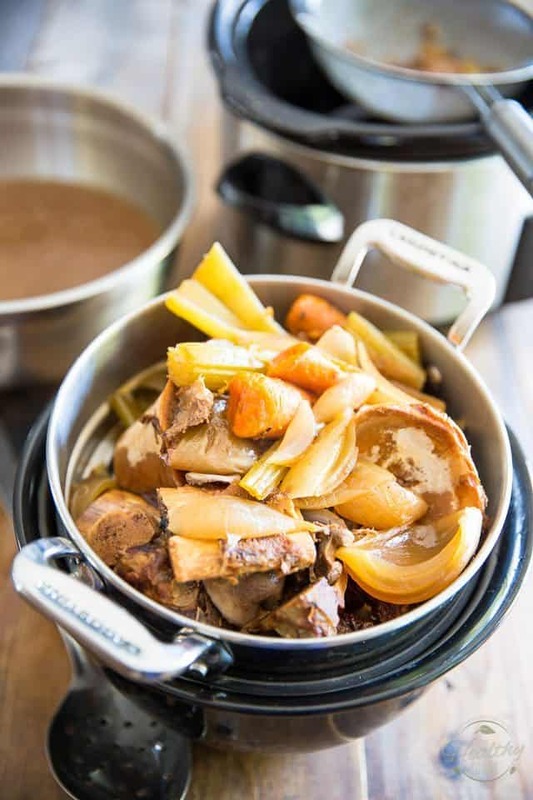 Once you’re done dealing with the larger pieces (and munching on them mushy carrots), strain the broth that’s still in the crockpot, using a fine meshed sieve this time, to catch even the tiniest of debris. If you didn’t have such a sieve, you could also use a regular strainer and line it with with a few layers of cheesecloth. Now, I don’t think I need to be telling you this, but still… be extremely careful when you do this since the bowl, as well as its content, will be extremely hot. 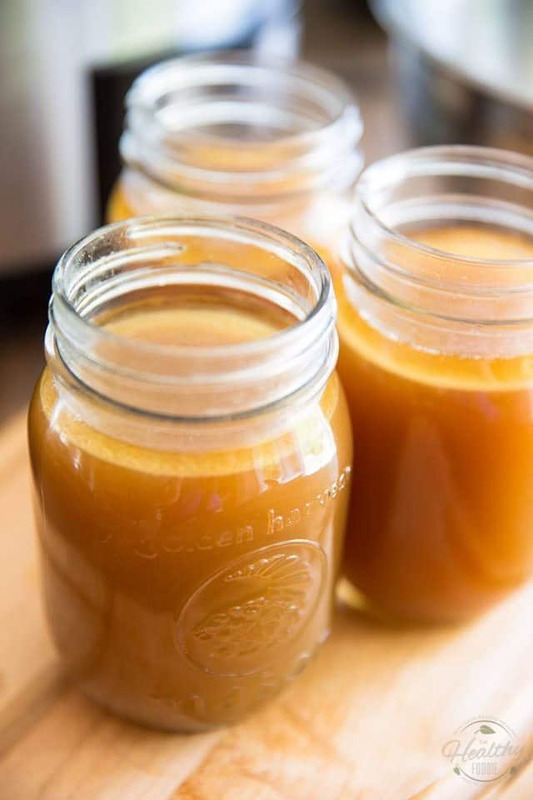 Finally, transfer your bone broth into individual jars and refrigerate promptly. 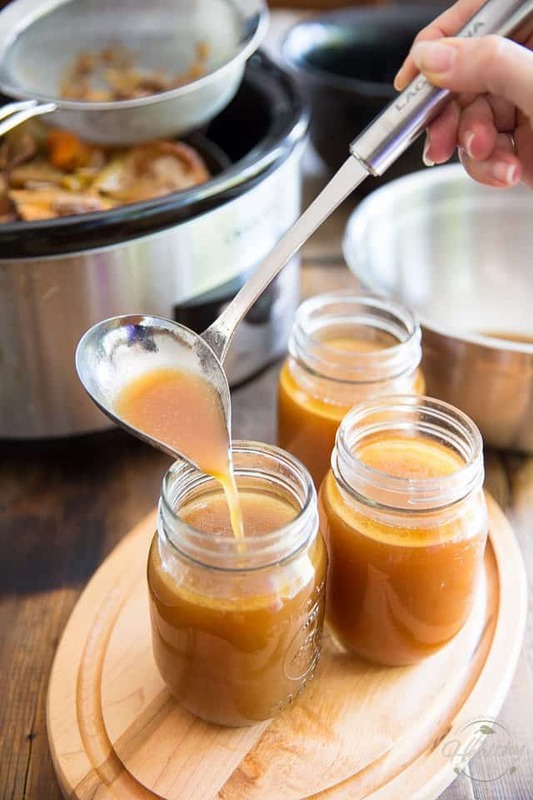 You don’t even need to put a lid on at this point, as the fat will float to the surface and form a protective barrier that will prevent air from getting in contact with your broth. Just look at that amazing jell’o broth! Of course, you’re going to want to reheat your broth before you use it or drink it. I like my broth piping hot with a pinch of salt and pepper, and a tiny little bit of freshly chopped parsley. Oh, and a little hint of love, too! Let’s not forget the love! Now, despite it being super easy to make, sometimes you just don’t have the time to whip up a fresh batch of bone broth. 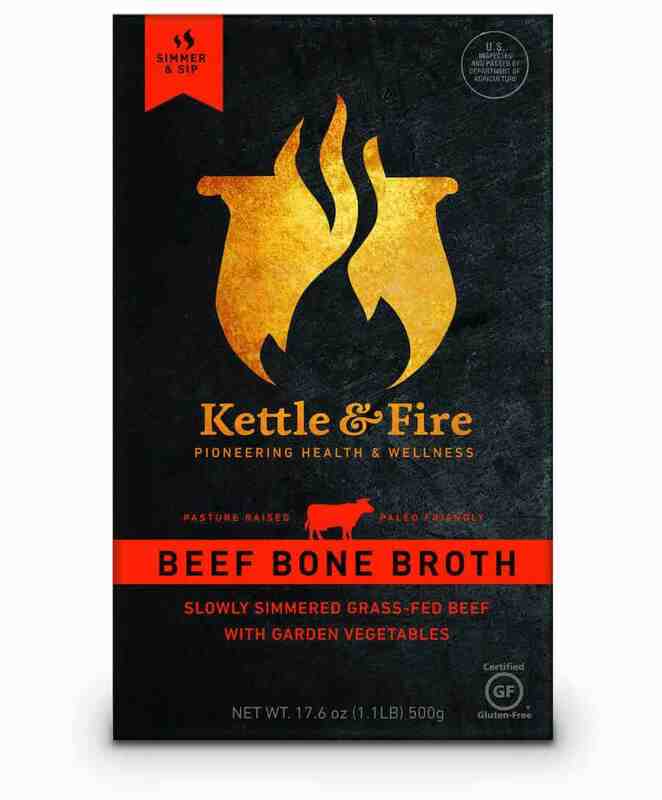 There are a few brands of pre-made broths on the market, but my personal favorite is Kettle & Fire’s ready made grass-fed beef bone broth. These guys use the best organic ingredients and grass-fed bones, which provide the richest beef flavor. It couldn’t hurt to keep a few of these boxes in your pantry at all times, just in case… You never know when it may save your life! Plus, they’ve kindly provided a 15% promotion code for first time orders: just use “THEHEALTHYFOODIE15” on their online store. So stock up on some of the pre-made stuff for emergencies, but when time permits, make some of your own! Place the bones in a single layer on a baking sheet or roasting pan; roast for 60 minutes, flipping each bone over half way through cooking time. Meanwhile, roughly chop the vegetables (don't even bother peeling them) and place them, along with the bay leaf and apple cider vinegar into a 6 quart slow cooker. Add the bones as soon as they come out of the oven and then fill the pot completely with water. Carefully remove the larger pieces with a slotted spoon and place them in a strainer set over a large bowl to collect the excess broth. Then, strain the broth that's still in the crockpot through a fine meshed sieve, or through a strainer that's been lined with cheesecloth. Transfer the bone broth into jars and refrigerate promptly. The fat will float to the surface and form a protective barrier that will prevent air from getting in contact with your broth. 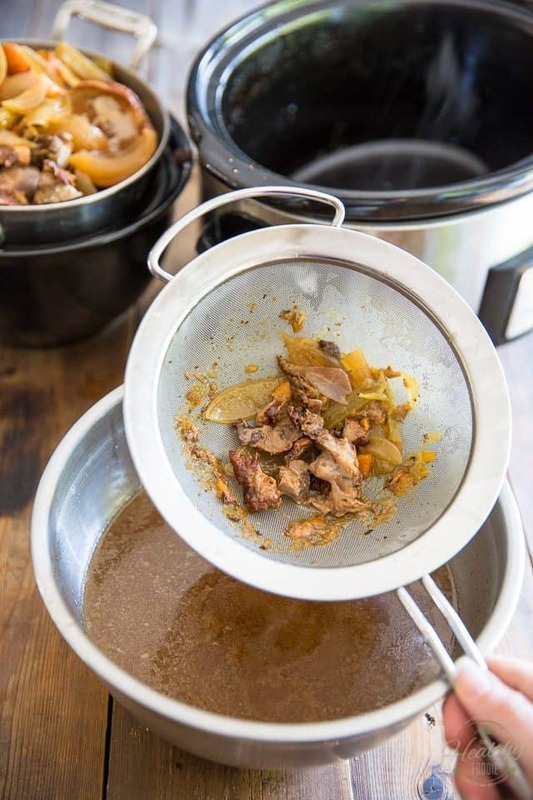 Once the broth has fully cooled, you'll be able to to remove some or all of that fat layer of fat that formed at the top, which you'll then be able to use for cooking. 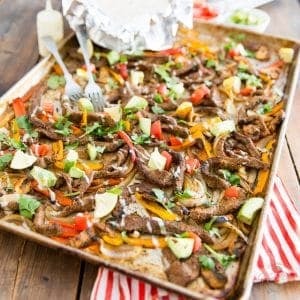 Sheet Pan Steak Fajitas – Ready in 10 minutes! This looks great! But where did u get those mugs? They are pint size mason jars for canning! Sonia, she’s talking about the Rae Dunn mug with LOVE on it, not the mason jars. Can you can your beef broth ? I really wouldn’t see why not, Julie! So how would you can it? You can freeze the both in ice cube trays! This recipe says it makes 3-4 cups. Is that accurate? Mine made a lot more than that. That mug though? Where might I find them? Tj max. Has them very reasonable. A nice brand I just got turned on to! Wondering what I did wrong. My batch looks clear brown and taste oily. I trained mine with the cheesecloth. I’m a first timer, is it suppose to be clear dark brown or cloudy like your pictures? Did you let it sit in the fridge, Judy? Once the fat has set and firmed up, you can remove it with and then your broth won’t be as oily. What makes mine look cloudy is that tiny film of fat that floats at top. It’s supposed to be clear! This is just brown beef stock. Bone broth is just a trendy name for it. Actually beef broth is mostly made with scraps of meat rather then the bones. The difference between the two is that the collagen that seeps out of the bones while making “bone broth” is what you want, that’s what’s going to help with gut health. Does it if the bones are meaty? What I do is I cool the broth in the slow cooker bowl and remove some of the fat on top to fry eggs and potatoes; I save a nice layer to flavor the broth even more. I fill up pint or quart jars. I can drink a pint of the stuff a day; sometimes I dilute it just a little bit. I have found grass fed bones at Sprouts, but online stores have a greater variety of bones. I also put some of the cooled broth in plastic ice trays and freeze it; whenever I need some broth, 2 – 3 cubes melted in the microwave makes a nice mug full. I season the broth when I serve it. I also add the cubes to other dishes for flavor, like I would commercial broth, and sometimes with it, so I can save my broth for sipping. Sorry, but I’m not sure I understand your questions, Terri. What do you mean exactly? To make a clearer broth, boil the meat for a couple of minutes to loosen the impurities, then drain and rinse thoroughly before adding water to make the broth. 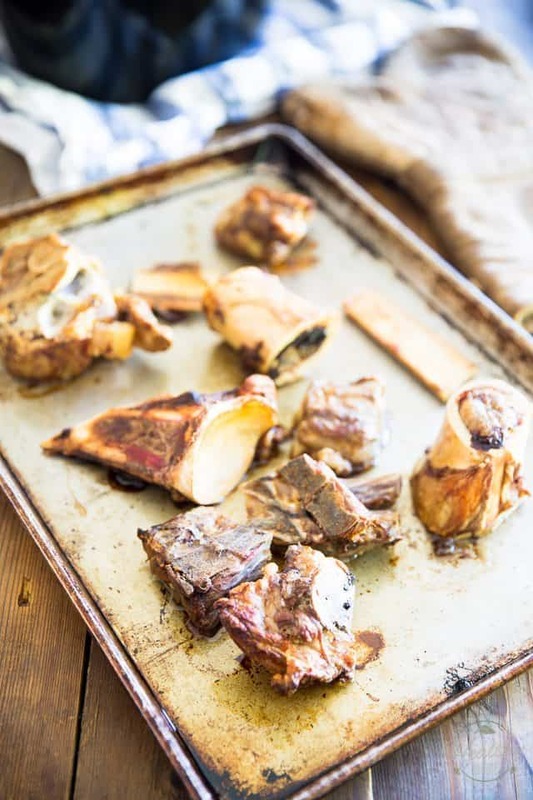 Roasting the bones is not necessary, but if preferred, roast, then boil briefly, perhaps a minute or two to loosen the impurities, drain rinse and proceed. Th result will be much more attractive. The boil is brief and will not lessen the final flavor at all. I picked this up from a Vietnamese lady who taught me to make Pho soup. Thanks Roger, those are great tips, all! Another way to make clearer broth is to soaking the bone in water for one hr to draw out retaining blood. This is Korean way. What impurities ? If you use bones from grass fed beef etc. what would the impurities be ? Thank you, that will be very helpful for making this for the first time. What impurities? Could you elaborate a little bit more on that, please? Can you freeze it in the jars? I wouldn’t freeze it in glass jars… if you’re going to freeze it opt for resealable bags or plastic containers instead. If you want to freeze it, let it cool and then place in ice trays or muffin tins. Once frozen, pop them out and place in a freezer bag. You can pop in the microwave to return to liquid state and heat up to drink. Hey great tip. I just made this which resulted in approx a gallon, and making a second batch. Was looking for info on freezing for later use. Muffin time us perfect! Individual portions as needed! Perfect tip! Great idea, the muffin pans! Can you put in the freezer and take when you need??? I’ve successfully made bone broth on the stove several times. This time though I let it simmer much longer, over 36 hours. It started out with plenty of liquid but this morning it was all gone! What did I do wrong?? After 36 hours on the stove top, most of the liquid no doubt evaporated, Bethany. If you’re gonna let your broth simmer for that long, you absolutely must use a slow cooker. It’s the only cooking device that produces it’s own moisture, so the liquids won’t evaporate. I used a slow cooker and still had to add water multiple times…. do you know what I did wrong? Or a faulty slow-cooker, perhaps? 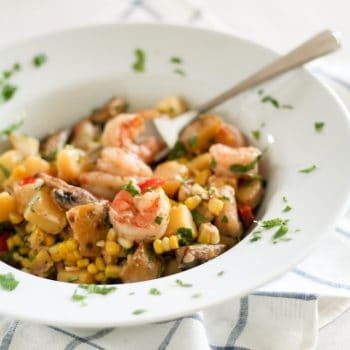 Have you had similar problems with other dishes where you’ve had to add liquid during cooking or wouldn’t have any liquid left in the pot when the dish was done cooking? I use 2 slow cookers once a months and cook about 3.25 lbs of bones in each, with all the herb, spices, stewed tomatoes, onions, celery, garlic and apple cider vinegar on high for 3.5 days. Never have to add water. Always fill up with as much water as possible. Have been doing this for sometime and have never had to add water or any fluid. I believe your error is that you didn’t put the contents in a sealed lid receptacle, as in slow/pressure cooker(s) so as not to let the liquid vaporize into the air. I have pressure cooker(s) with slow cooker option but it is a sealed cooking vessel. I just made it on the electric stove in a pot with glas cover and after 50 Hours still all liquid is there. It was on 1 to 2 so low as I could and still see Some small bubbels from boiling i can send a video if you like. I’m using short ribs. I boil them for a couple of hours then add vegetables. Great soup. Can I freeze this once it’s cooled? If so, for how long? Absolutely, Krista! I like to freeze mine in freezer bags, in one or two cups servings. The broth will keep for up to a few months in the freezer. Not safe to process that way. Unless you are going to keep it refrigerated. It is better to use a pressure canner, follow manufacturer’s instructions or Ball Blue Book to process safely so you don’t get sick. The fat portion that you remove for cooking, how do you store that and how long is it good for? I usually just put mine in a glass Mason type jar and store it in the refrigerator. I wouldn’t keep it for more than a couple of weeks. Thank you for the quick response! I will try that! What do you use the left over fat for in cooking? Instead of oil? Isn’t that fat layer collagen and bone marrow? And worthy of keeping (unless too thick) to drink in bone broth? I did with my broth. A little bit greasy, but adds a richness I quickly embraced. Plus, the health benefits of both for IBD. Great article with the details, thank you Sonia! Thanks for the great Recipe and instructions, Sonia. If a person were going to have some bone broth every day one would have to have a pot on all the time!!! I don’t mind at all, Michelle, in fact, I strongly encourage it! I love it when you guys interact with one another. Healthy discussions are always appreciated! Michelle I do use onions. (I suffer from microscp colitis.) I cook the bones with water only for almost 2 days. I remove the bones, filter then add carrots, 1 lrg onion, several fresh bay leaves, parsley, rosemary, thyme, a little salt and pepper and simmer for 2 hours. The onions don’t seem to aggravate my condition like garlic will. I will try Sonia’s crockpot version next time! Less babysitting the pot and adding water continuously. I use the fat to cook my cabbage for the soup i make with this broth. It is spectacular. Oooooh, sounds yummy! I love me a good bowl of cabbage soup, from time to time! Omgosh, that sounds wonderful and a great idea. I was wondering what to do with the fat that collects on the broth after it’s 1st refrigerated. I keep it in the fridge and use it as a cooking fat. Do the bones need to have a lot of meat on them ? I’m worried mine are too trimmed . They are in a slow cooker . Should I keep the lid on ? No they don’t… in fact, they don’t have to have much meat at all on them. And yes, you definitely need to keep the lid on! Thank you for your quick response. My broth has been in the slow cooker for 24 hrs. And it seems very oily. I did put apple cider vinegar in .. Any suggestions ? What I would do if you don’t care for the fat in your broth is put it in the fridge to set and then scrape the layer of fat once it’s floated to the surface and set. Be sure to hold on to that fat and use it for cooking, though! That’s good and tasty stuff! You should also be able to find one locally in any store that sells kitchen equipment. I have a question do you buy the ones from the butcher? Or do you cook ribs or your meet and then save the bones? That’s where I am still confirmed do I buy mean with bones cook meat and save or are raw bones better and if so how do you get those??? You need to use raw bones, Ashley. Your butcher will gladly hook you up with some, if they’re not available in the counter. Thank you for the recipe. This is my first time making bone broth so we will see how it goes. I have about 6 hours until it is done. My questions is this, after I cooked the bones in the oven for an hour, there was a lot of oil/grease on my pan. I ended up just tossing it, but I was wondering did I need to include that? I figured it would make it too greasy if I did, but I thought I’d double check. After rereading your post it didn’t say anything about adding it, so I assume it was ok to toss. That’s entirely up to you, Sue. If you’re wanting a higher fat content, then definitely include it. If you prefer a lighter broth, leave it out. 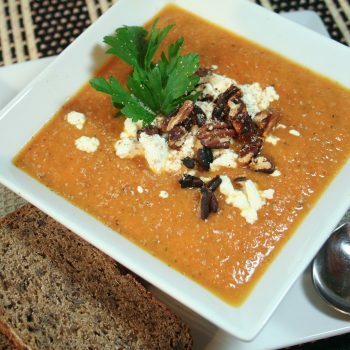 Hi Sonya, love the recipe and want to try it. 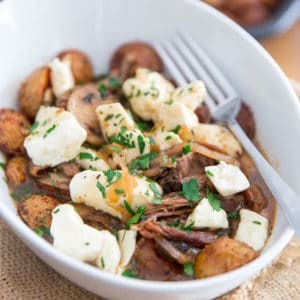 Questions, I only have a small 4qt slow cooker. I assume I can cook it in a stockpot on low? If so, how long should I let it sit and is there anything else I should know (first timer)? Thanks! Sorry Sonia, O just noticed that I spelled your name wrong. Opps!! Where do you get your bones to use? At the grocery store or butcher shop. You could always leave the onions out next time, that wouldn’t pose a problem. I really like this recipe. I don’t strain mine or discard the vegetables. I use an immersion blender and get a nice thick soup with little chunks of veggies. I let the pot cool and then stick the whole thing in the fridge. Next day I scrape off the huge layer of fat and then freeze portions. I really quite like this idea! I take it you remove the bones first? Great recipe and excellent discussion. I use a recipe from Emeril, and it’s very similar, except it adds an additional 30 minutes of roasting with the bones covered with tomato paste and the veggies thrown in the pan also. Once the broth is finished, I use a separator to remove the liquified fat, and then I transfer the broth to 1-cup Ziploc plastic containers for freezing. Once frozen, microwaving the container for 5 minutes on high does the trick, and I like to amp the hot broth up with turmeric, black pepper, coconut oil, and a dusting of Cayenne. Can this be canned in jars and kept on the shelf? If so how? You have to use a pressure cooker for the broth when canning. I just want to double check the instructions that it is okay to turn to crock pot setting to low at the start and let it cook this way without having to bring it to a boil first. How much apple cider vinegar do I use? I have joint problems and was told to try glucosamine, but all the bottles say they are made with shellfish, and I’m allergic! So, I’m going to try this and see if it makes me feel better. I read somewhere that putting the hot broth directly in the fridge can promote bacteria growth. They suggest using ice cubes to cool it quicker before refrigeration. Do you think this is necessary?And how many cubes do you think would be the limit? I don’t want to risk a watered down broth. I’m going to try this for the first time. I’m also not sure how much vinegar to use. So long as you transfer the broth to small containers, it’s very much ok, and even preferable, to refrigerate it while it’s still hot, Amber. And I’m not sure I understand why you say that you’re not sure how much vinegar to use? Hi! Never mind the vinegar question, it’s right there in the recipe. I saw that later. I made this broth yesterday, it looks just like yours and is totally delicious! Thank you for the amazing recipe and all the pictures 🙂 I seasoned with salt and pepper before roasting as per your suggestion. The only thing I did differently was boil the bones and simmer them for 20 min before roasting. I read that in a different article it’s a good way to get rid of some nasty bits that could end up in the broth. I’m drinking this strait and not using it for other recipes, so I think next time I will try some other seasonings just to make it interesting. Here’s to good health! Thanks again! hi,I made bone broth I baked my bones.I let them cool and put them in the fridge for a week almost two wks. I finally got them into the crock pot to simmer I notice the color is not brown like yours it looks like chicken broth and greasy looking. It doesn’t smell good but it doesn’t smell bad. Should I start a fresh batch? Help!!! If it was me, I would definitely chuck this batch and start a fresh one. Also, it’s best to make the broth as soon as the bones come out of the oven. I just made my second batch of your yummy bone broth. I also add leek and spring onions to the rest of the vegetables as I love the flavour infusion. However, I find that I get very bloated after eating it which is a bummer as I’d like to eat it almost every day. Have you had similar experience? Do you think it’s the leek? Have just read all the comments and now feel pretty positive about making my first batch of bone broth. I just bought a slow cooker and will be starting it tomorrow morning. Thankyou to everyone with their questions and also Sonia for the recipe and post. seems like a lot of work for 3-4 cups…my wife and i drink 8-12oz of store bought broth everyday and thought i should start making my own…not sure if it’s worth it if i need to do this a few times a week. say what?? this produces way more than 3 or 4 cups! the richness and depth of flavour allows for no comparison to store bought. Your health is worth it and you spend more time running to the store to buy it in a way. I use a slow cooker and freeze the broth in cubes. Much healthier and no MSG. I’m already taking a Korean beef bone broth for intestinal health but was thinking of trying your homemade recipe. I was wondering though, how is it that you use the fat for cooking? Like regular fat/ oil to grill and stir fry? Hi Sonia, I’m making beef bone broth. My marrow beef bones were bought raw and im wanting to roast them them now. The package says sell by August 6 and we know the butcher who packaged them for me. They smell a little funny but my butcher says they are still okay to use. He says they split the bones for packaging for me. So, today is AUGUST 6 th. My husband says he thinks it’s okay too. What would you do? I plan to slow cook in a crock pot for 36 hr. Thanks I appreciate your help. I would totally pass on any kind of meat that smelled funny… better safe than sorry! Those mushy vegetables are like candy for my dog. I don’t use onions because they are bad for dogs. But once all the broth is out of the pot I cool the vegetables, and add a large spoonful to one of his meals each day. He starts dancing and howling as soon as he sees me remove the vegie container from the fridge. Do you think it would be ok if I add ginger to this? Is it okay to “chew” on the bones and any marrow that might be left. My meat bones had some meat on them and I love to naw (sp?) on bones. Just wanted to note that I have bookmarked this and my second batch is in the slow cooker now. My first batch came out wonderful and half is still in the refrigerator. It was the best when I was sick a couple weeks back but is definitely best hot. What I found out is if you put it into the refrigerator hot, it almost is like canning in that the heat and rapid cooling seals the container. Mine have kept for 2 months in the back of the fridge where it is colder and unopened just fine. Not sure I can use those Ziploc containers again though they were heavier so held up pretty well. I do can my own chicken broth every few months and want to note you can definitely can this broth. Follow the same instructions as you would for chicken broth. You can put in the fridge to chill and strain the fat as usual if you want. If you do that, you have to bring it back up to a simmer before you ladle into cans. Then you have to pressure can it to get the high enough temps for non-acidic foods. That is what I am going to do with this second batch of beef broth. I am getting about 3 quarts of broth out of each batch and I don’t strain mine past getting the large chunks out or chill and scrape the fat. So I will get quite a few for the pantry this time around.. At $10 for the total ingredients and no salt added, it is a dream for those of us trying to watch our sodium. Just prepared this and loved the taste! 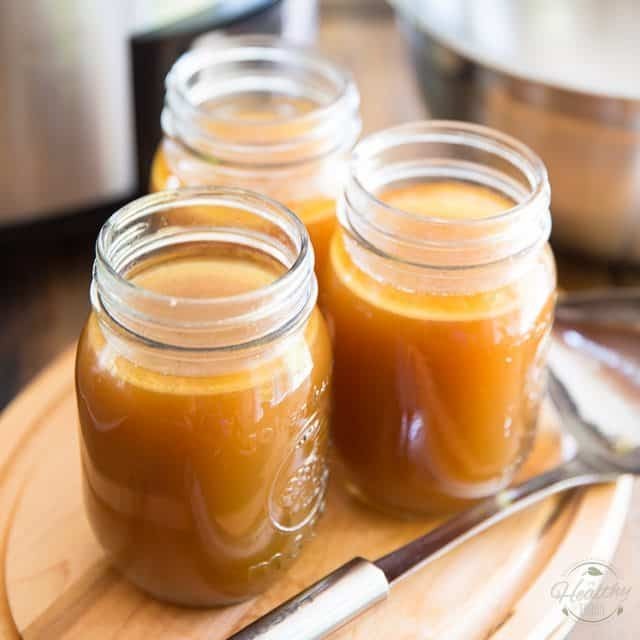 I’ve been making bone broth in the past and this recipe is great because I don’t have to worry about the flame going off on the stove…slow cooker is way better! 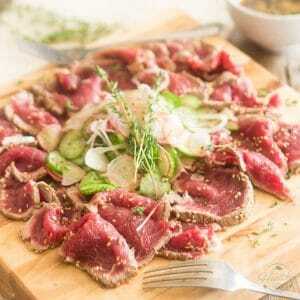 I just tweeted this recipe using your link and info. Many thanks! Many thanks to you, Nancy! And I totally agree with you. Slow cooker is the only way to go when making bone broth. Well, that or the Dutch oven! Just made my first batch of Beef Bone Broth in my slow-cooker and it’s delicious…Did season at the end of 48 hrs of cooking. Seasoned again to taste after I skimmed of the chilled fat an reheated in my soup mug. On to chicken bone broth next week!!! 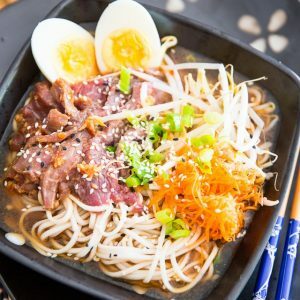 Thanks for this in depth recipe for a beginner. PS—my son thinks I should open Bone Broth food truck in NYC, “Nana’s Bone Broth”!!! ???? Haha! I love the idea of a bone broth food truck! 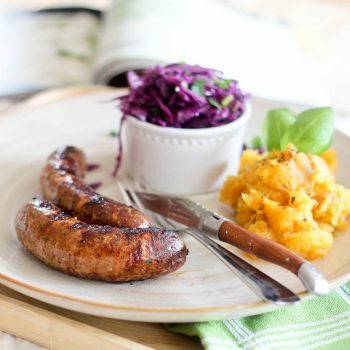 You could have all kinds of different varieties… beef, pork, chicken, lamb, venison. Hey, that could very well work! Love the idea of doing the broth in the crock pot so you can set it and forget it for the day. Will try this if we ever get fall weather this year! Do I add the juices from the pan after the bones have been roasted? It’s up to you Naomi, but I totally do! I have read where other people reuse the bones to makes more batches, have you ever done this and had success? This is the best bone broth recipe bar none. I’m convinced that roasting the bones in the oven for an hour makes all the difference in the world in the flavor. I added carrots, onion, celery, leeks & a handful of parsley & of course apple cider vinegar. Have you ever used celeriac or celery root (not sure what you call it…) in your bone broth? Thanks for a great recipe! My grocery store has frozen marrow bones. Are these ok to use? Frozen marrow bones? Ok to use? Thank you so much for quick reply. I can’t wait until my broth is done cooking!! Smells so good! How do you store the fat removed after cooling the broth…so to use it for future cooking? In the fridge, in an airtight container. Did you roast your bones long enough for them to turn brown and crispy? Why can’ I save bones from beef cuts I have cooked? There would be very little meat on them. From a purely nutritional stand point, it’s much better to use raw bones, but it’s also perfectly fine to use cooked or roasted bones if you want to. 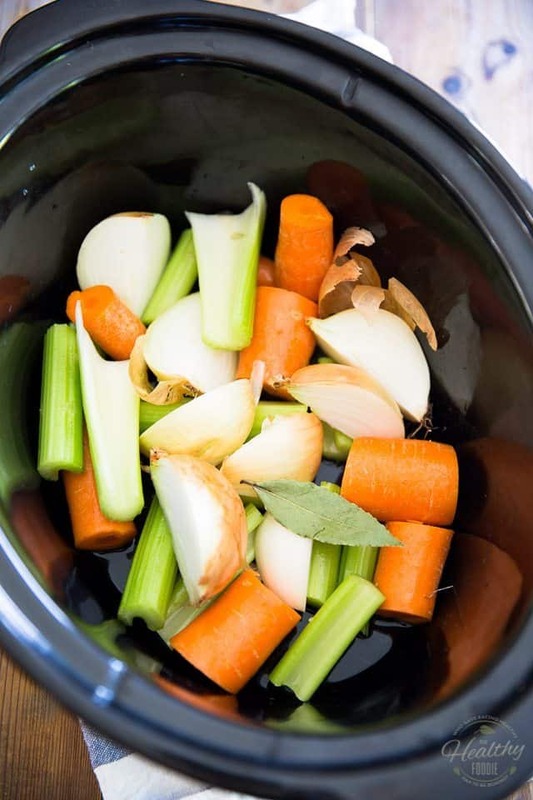 While the resulting broth will be tastier with leftover cooked bones, it won’t be quite as nutritionally rich as if you’d started with raw bones. I have been cooking my broth in a crock pot (6 qt.) And have been cooking for about 48 hrs. on low. Comes out a deep brown but no gel, very thin. Cooking with Veges, tastes good. Using grass fed beef bones. Any thoughts? Thank you, this was a very helpful article. I made this, but it turned to jello in the refrigerator. Is there a way to keep it from doing this? It turned back to liquid after I warmed it up, but even though I removed the fat on top it still tastes oily. Also, do you know the nutritional facts for 8oz of this broth? Jello is good! That’s a sign of a good broth. Why would you want to keep it from doing this, if I may ask? If made exactly like yours, what are the nutrition numbers, roughly? I skim the fat away for later use and just enjoy the broth. Use the fat for shortening in any way. My mother used it in making her “dump-in” cookies. Once served to her book club and a guest visitor, she was asked for the recipe. Mother said she didn’t really have a recipe. Her basic template was about 1 part shortening, 2 parts sugar, 4 parts flour. The shortening could be butter, left over salad dressing, vegetable oil, etc. 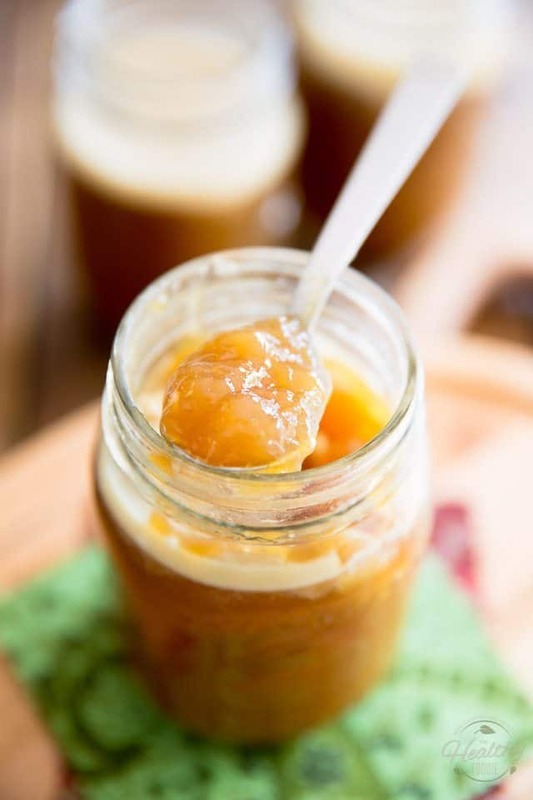 Sugar could be brown or white, molasses, maple syrup, honey , or the scrapings from a jar of jelly. Flour could be oatmeal, wholewheat flour, left over cooked cereal, etc. The lady wanted to know what KIND of shortening? Mother said ANY kind. But what kind did you use for THESE cookies? Mother finally had to confess. This was in Suburbia in the 1940s, and Mother was an anomaly. Her friends all laughed. They knew her well. By the way, she always boiled bone twice. She said you didn’t get the gelatin until the second boiling. So I always boil (simmer, that is) twice too. I need a new crock pot. Mine is old, small, and does not simmer. So I make soup or broth in a large stock pot and put it on my one burner that will go low enough to keep it at a slow simmer for a couple of days. With a tight lid, it hardly evaporates at all. No getting up at night! It all depends on your stove and your pot! Happy brothing. 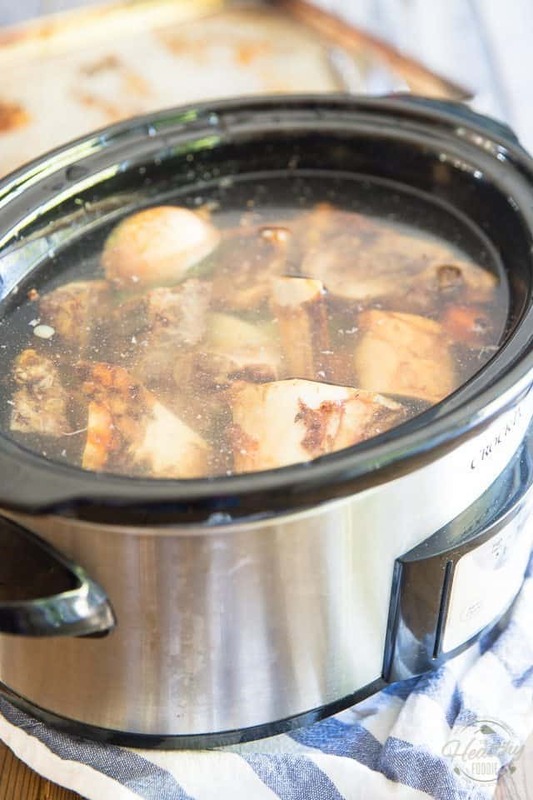 Wow, this slow-cooker bone broth looks so delicious! Has anyone tried canning the broth after cooking it? How long would it keep? I don’t think that this would change much… rinsing would mostly remove any impurities, if present. Your best bet would be to refrigerate the finished broth and then remove the layer of fat that will have formed on top once it’s completely set. Hello! Do I add the juice in the pan I roasted my marrow bones in?? That much is entirely up to you… it’s mostly pure fat, but good fat! You can throw it in, or save it to cook with! I just bought 2 – 7 qt crock pots let the bone broth making begin. I always wanted to make bone broth but didn’t want to set my house on fire leaving it cooking on the stove all night while we slept. Can’t wait to taste this liquid gold. Hi I have a few questions. I am making this for my toddler who has tummy issues. So we stay aways from herbs, onion, and garlic right now. Would this still work with just beef bones, carrots, and water? Do you just keep restarting your slow cooker. The longest is 12 hrs for mine or can I do this on the stove for 18 hrs? Lastly to know for sure that I did it right after it is cooled it will be jelly like right not like normal beef broth liquid. Thanks! Absolutely, Ann, you don’t HAVE to add the herbs, onions or garlic. They add flavor and nutriments, but the only essential ingredients really are the bones, water and ideally, apple cider vinegar. My slow cooker will stay on for as long as I leave it on, so I don’t need to restart it… I don’t recommend doing this on the stove: the slow cooker produces its own moisture so the liquid doesn’t evaporate, and it’s also safe to leave unattended. On the stove top, your liquid would evaporate so you’d have to add much, much more and it wouldn’t be safe to leave it on when you’re not around. And yes, your bone broth should congeal when refrigerated. Hope this helps, and happy bone broth making! Makes sense to me. Thank you for your quick reply. No bones for Boo and Mitzi! Now I need to go to the store and pick up some raw bones for them…… Again, thx!! I successfully made this! It was, or I should say IS soooo delicious, because I still have a lot left! I just had some for breakfast! I am new to AIP and I’m so glad I found your recipe! Thank you!!! If I want to add a little meat into my broth, do I need to roast it too or just add it raw with my vegetables? Roast it along with your bones. It’ll add that much more flavor! My question is a technical one. I’m using this recipe to avoid buying collagen powder as well as replacing my morning coffee for this beverage instead. Im currently taking in about 13,200mg of collagen powder per day, so if I were to roast 3lbs of beef bone and use 3 qts of water in my slower cooker, how much should I drink per day to insure I’m hitting that 13,200 sweet spot to get a good dose of collagen? I don’t want to drink too little or too much (I already drink 3 liters of water everyday, so I’m just trying to get my collagen in). I have heard that you should use both joint bones and meaty bones in equal proportions for bone broth. Is this correct? Also, your recipe calls for filtered water. Would this be the same as distilled water or if not, what would I look for at the store? 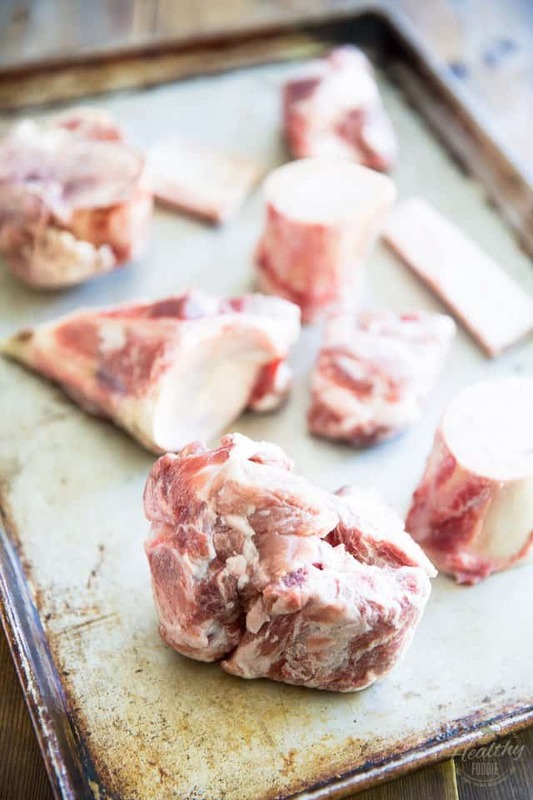 The ratio of meaty bones to joint bones is not an exact science, but you do need both in order to make optimum bone broth. Distilled water is not the same as filtered water; you can filter your own water or use bottled water. Or even use your tap water, if you trust it! What is the nutrition facts per cup of this broth? Hi! 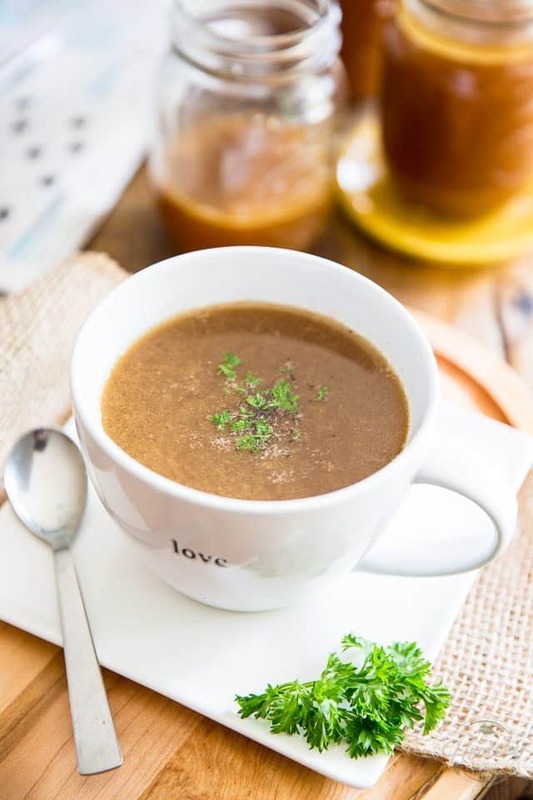 I’m new to making broths and crockpot cooking and I’m very excited to use this recipe. My question is about the fat: What can you do with the fat? I am self-teaching myself how to cook so the concept of using fat is unfamiliar to me. Do you use it like you would use olive oil in a stir fry pan to cook burgers or something? I just want to get the most out of it, and it sounds like the fat might be really tasty! I use mine as a cooking fat indeed, but you can also use it to add to dishes, when suitable. Mashed potatoes come to mind, but I’m sure you can think of many more options! I used meaty bones as well as femur bones. I roasted them first. Then in my crock pot with all the vegetables on low for 24 hours. The broth is a beautiful color however is is not gelling. Will it still be full of nutrition! My grocery store sells bones for dogs. Can I use these bones to make broth? How much do you recommend consuming and how often? Have my first batch in the crockpot now. They say anywhere from one to four cups a day… Personally, I like to mostly use mine for cooking. I use it in practically everything! Sorry…I read the link you provided previously and realize the bones available at my Whole Foods are “long” bones not knuckles. I’ve ordered some online. I’ll try again next week! Interested in trying this recipe, but am concerned about the yield. It says servings: 3-4 cups. Does your liquid mostly evaporate or is that a typo? I wouldn’t want to put this much time into less than 1 L of stock, so just curious. Thank you. It’s not a typo, Marie, about one liter is correct. I only got 1.5 cups of liquid. Very disappointing since I paid 25 for the bones from the butcher. I used a crockpot slow cooker and let it simmer 36 hours. It is very dark which I don’t mind. But it was very pricey for 1.5 cups of liquid, Should I have added water? WHOA, that’s a lot of money for bones!!! I think you should find a new butcher! 😉 1.5 cups seems like very little liquid to be left with at the end of the process… What size crockpot did you use? And did you fill it all the way up to start with? If you don’t have a grease strainer if you let it cool a bit use a gallon bag. Fill the bag, cut the corner and let the liquid, other than the grease, fill your vessel with goodness! I accidentally put my crockpot on high instead of low, it’s been cooking for almost 24 hours, plenty of liquid in the pot. Is it ok to keep cooking on high? Should I switch to low now or just leave it?? Personally I would switch to low, but as long as you still have plenty of liquid in that crockpot, you’re all good! We purchased 1/4 of a cow in bulk and the butcher gave us all of the bones once he had carved the cuts. I have all the bones in the freezer and want to make broth but am unsure if I can freeze the fresh cooked broth, given the bones were frozen to start with. That old quandary of “not refreezing cooked meat if it was frozen to start with” … don’t know if that applies to bones? Freezing the broth should not be a problem, Ben… I do it all the time and have never had any issues! Very nice website and bone broth posting! I do this all the time using only veggie scraps. When the scrap bag overwhelms my freezer, it’s time to make a new batch. I do some slow cook and some pressure cook. After straining, I put the broth in metal bowls in fridge and a day or two later, I skim and discard all the fat from the top and freeze it all in glass containers. I hope I’m not doing myself a disservice by dumping that layer of fat, but I feel like I’m doing myself a favor by not consuming it. I rarely see that mentioned in bone broth recipes. It seems like everyone is consuming that fat layer. Except me, I guess! I made this recipe, followed the directions exactly. I was able to get 8 pints, plus a mug to enjoy right away. The initial cup full was a bit oily as it had not set and allowed for the oils to rise and be removed. But, it was still very good, just a bit of salt and pepper and a dash of Worcestershire sauce. I will definitely be making this again and again. It turned out a beautiful brownish/caramel color and tastes amazing. Best broth I have ever had! I just got my batch in the crock pot! So excited! My mother introduced/made me bone broth right after I had my baby, and now I am preparing some for my 6 month old daughter to consume as some of her first food. I used bone marrow and 1/8 onion (don’t want too gassy of a baby) 3 carrots and some garlic cloves and some apple cider vinegar. Thank you for the recipe! So it’s been 20hrs of slow cooking the roasted marrow bones and my broth is very light in color. Looks more like chicken broth. Is this due to lack of knuckles or ox tails? Thank you! Oh and it’s very bland, not much flavor. Is that normal? I made this bone broth again yesterday, let cool a bit in the crock then placed the crock with broth in refrigerator over night. Is this ok? Hello. I’ve read that the benefits of bone broth only happen with bones from grass fed cows. Comments? Did I miss the macros or does it not matter. So good. I actually used a bag of frozen “soup bones” from the grocery store. But I put in all the veg’s plus leeks (the whites and greens, whole thing!) 36 hrs on low in the slow cooker. Amazing scent, great flavor. Only negative is the whole recipe in a 6 qt pot only made 2 qts of broth. I’m not sure about adding water, really… I think it sorta kind of defeats the purpose, unless you’re gonna let your broth simmer for another long while after adding the water, i.e. 12 to 24 hours more. I think you would have been better off stopping it after 24 hours, then you’d have been left with a bit more bone broth. You should NOT immediately refrigerate the hot broth. Place it in your jars, let sit on the counter until it reaches the appropriate safe temperature range, then refrigerate. I am a Chef and ServSafe Certified. Hello, I’m wondering if you have made this with instant pot. If so, how long does it take? Is it possible to use an instant pot/pressure cooker to speed the process, or does it need to just simmer for a long time? I tried the store bought expensive bone broth and it did not hold a candle to this homemade broth. Won’t waste my money in future because it so easy to make! Some people have an ongoing pot of bone broth simmering in their slow cooker… so I don’t see why there would be a problem with leaving it for 4 days. Just check your liquid levels and top as necessary, I guess. The recipe calls for stalks of celery. I’m pretty sure that it meant to be ribs of celery. The stalk is the entire plant harvested from the garden and the ribs are pulled off individually. Wondering if anyone has any ideas about using wild game for making bone broth? I just stumbled on this site. It’s awesome! So glad I found you. I’m going to do my bone broth now. Thanks. 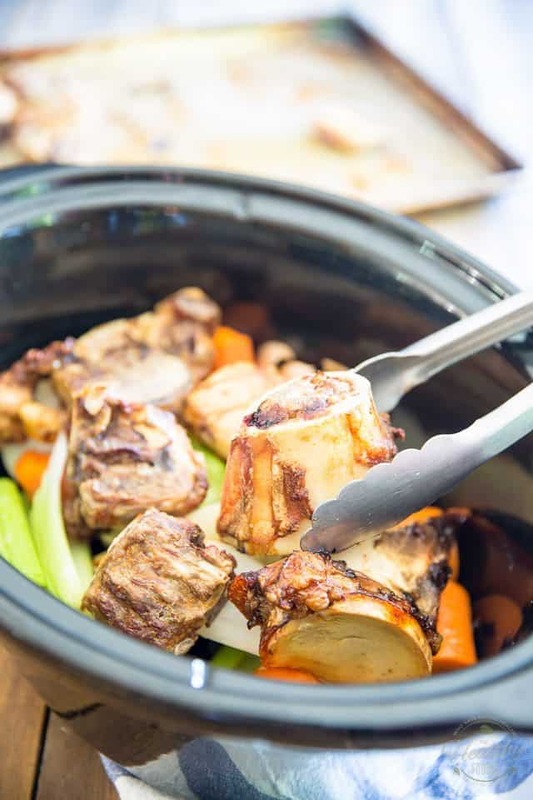 Generally, slow cookers create their own moisture and liquid evaporates very little, so you should be fine. If you find that the liquid is getting too low, you can always add more water as you go. I would like to mention how good a roasted turkey or chicken wreck is using this recipe. Careful on the salt though. We harvest ducks and geese and use these roasted carcasses as well. Venison makes good broth as well. We do not use the tallow though. The poultry bones are completely soft after 24 hrs. Always process them into our dogs ration. 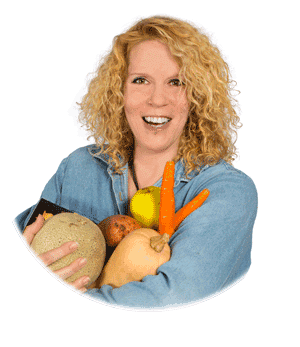 You can leave the carrots in, Kat, since you will end up discarding them once everything is said and done. And drink as often as you like, really! I am new to broth making and just made broth. I’m reading conflicting information on how to cool it. Can I not just strain it into mason jars and put directly in our sub-zero fridge (I’m not super concerned about our fridge “heating up” b/c of a few jars of broth). Also, some say skim the fat (that it contains impurities and causes LDL to rise and others say to keep it? Health wise, does it really matter? Thank you so much! You should totally refrigerate the broth as soon as it’s done and strained. As for the fat, I prefer to leave it on, as it forms a natural protective barrier from the air, but if you rather skim it, it’s entirely up to you! Bought a bag of frozen bones at supermarket called “Bones for broth”. Cooked in pot on stove till browned ( my crockpot has metal insert). Added onions and garlic, plus a tbsp of ACV and pink salt. Added water to the top of crockpot. Lovely brown color but very greasy and flavorless. I cooked this recipe exactly as stated, but I went for about 28 hours on low. I only got 24oz. Did I do something wrong? Half my liquid was gone. Look Ma! I Made Sausage!